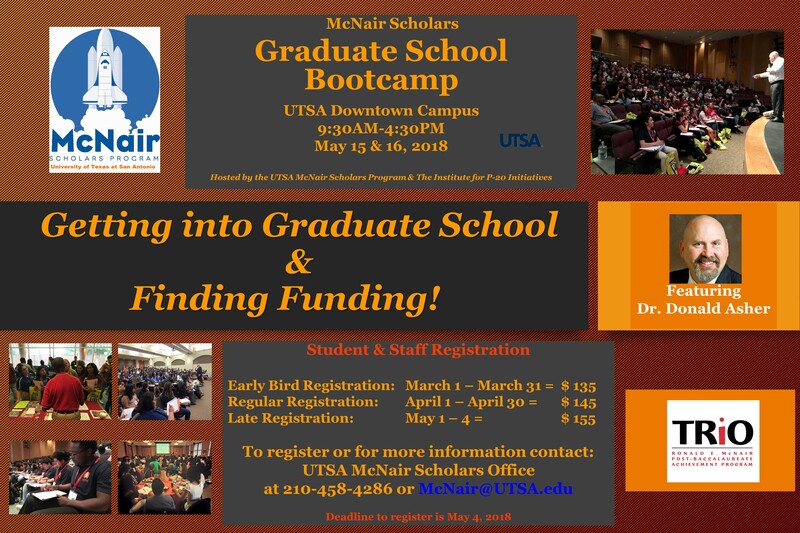 The University of Texas at San Antonio McNair Scholars Program is proud to announce that it will be hosting its 5th Annual Graduate School Boot Camp. We hope to see you this summer in San Antonio, Texas May 15 & 16, 2018 for an intensive two day workshop featuring international speaker and author, Dr. Donald Asher. While you’re in the area, be sure to visit some nearby universities and learn more about their wonderful graduate programs. In addition to the Graduate School at UTSA, San Antonio is home to other graduate schools such as St. Mary’s University, Our Lady of the Lake University, and others. Also, UT-Austin and Texas State University are located a relatively short drive north of San Antonio and are easy to include in your trip itinerary. Donald Asher’s riveting presentation is full of secrets for successful graduate school admission. This year’s registration fee will include breakfast, lunch and snacks for both days, and limited campus parking. Please contact Ms. Sonia Valencia, McNair Program Manager at (210) 458-4274 or Sonia.Valencia@utsa.edu or McNair@utsa.edu for additional questions regarding this year’s event.